Lot Size: 1345 sq. m.
Rare opportunity to own one the most spectacular custom made properties in the highlands of western Panama, located in the Volcancito section of Boquete. Beautiful panoramic views of the lights of David, Pacific coastline, and Vulcan Baru (Panama’s highest peak) from a 4,000 ft + elevation. Blessed with a temperate micro climate temperatures rarely vary from 65 degrees to 75 F, making air conditioning unnecessary. Surrounded by lush vegetation, coffee plantations, exotic birds and flowers. Easily accessible to the city of David, Pacific beaches, Enrique Malek International Airport, and the Pan-American Highway, by a new 30+ km. four lane divided highway. 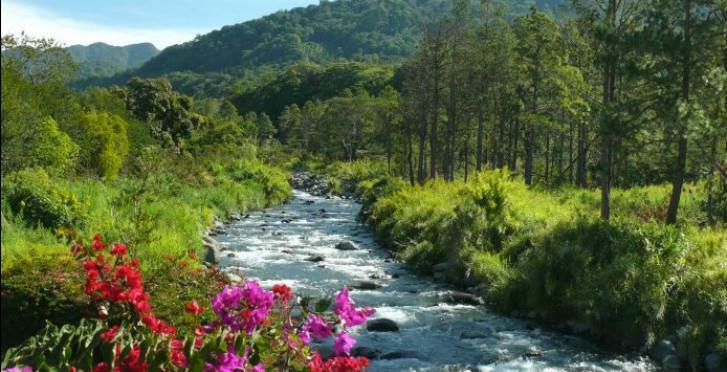 Located 3.5 miles from the center of Boquete, Chiriqui, Republic of Panama, considered by many sources to be in the top 5 of the most desirable places in the world to live. Size: approximate 6000 sq feet, built in end of 2009, corporation owned. Security alarm system for all floors. Finished attic, extra room ready to use. Two Propane gas tanks, 3 septic tanks, two 660-gallon capacity water tanks with advanced water filtration system including UV and carbon filters, large drainage system around the house and drive way, Spanish tile roof. Landscaped garden front and back, 3 car carport and extended driveway. Electrified security fence around outer perimeter of the property, stone wall and lighted electronic gate and intercom on street level. Cable Onda internet connection, TV and landline phone.